There is no better record of events than The New York Times, and now The Times of the Sixties captures the history, culture, and personalities of the decade through hundreds of articles and original commentary in this unique and fascinating book. Whether we lived through them or learned of them after the fact, the events of the 1960s — the beginning of the Vietnam War, the moon landing, the hippie movement, to name just a few — resonate strongly in our culture today. 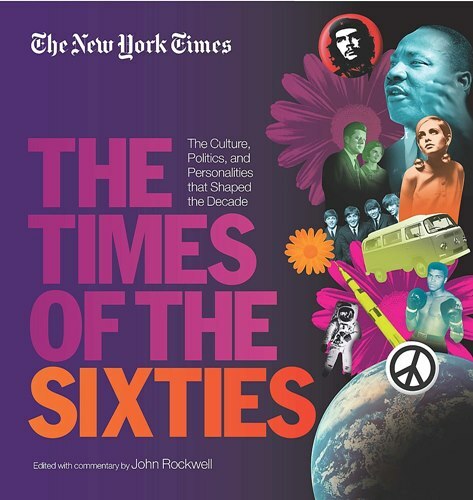 The Times of the Sixties represents one of the most fascinating, extensive, and well-rounded portraits of one of modern history's most tumultuous decades. More than 400 articles have been culled from the archives of The New York Times and brilliantly curated by staff writer John Rockwell. Articles feature coverage of historic events like the Cuban missile crisis, Martin Luther King's I Have A Dream speech, the assassination of President Kennedy; cultural highlights such as the British Invasion, movie reviews of Psycho, 2001: A Space Odyssey, and The Graduate, and features on music groups like the Supremes; plus pieces on pivotal political figures like John F. Kennedy, Mao Zedong, and Che Guevara, as well as influential personalities such as Muhammad Ali, Marilyn Monroe, and Betty Friedan. Rockwell guides readers through the articles he's selected, putting the events into historical context and exploring the far-reaching impact of these events and individuals. The book also includes hundreds of black-and-white and color photographs from the Times and other sources.